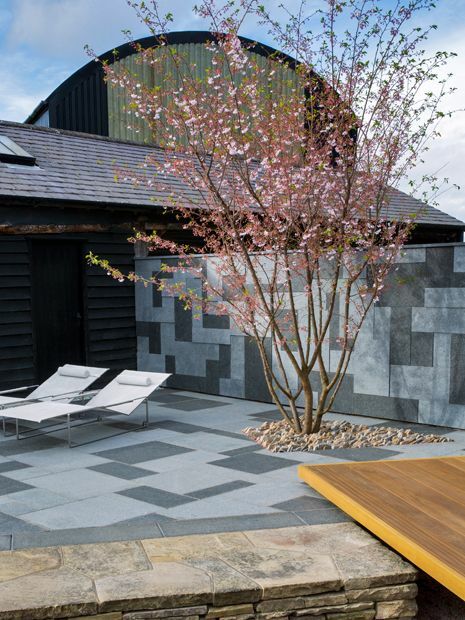 Having known the clients and the site for a few years, we returned to create a third project in the Essex countryside, and transform a 220-square-metre, west-facing courtyard into a modern Japanese garden. 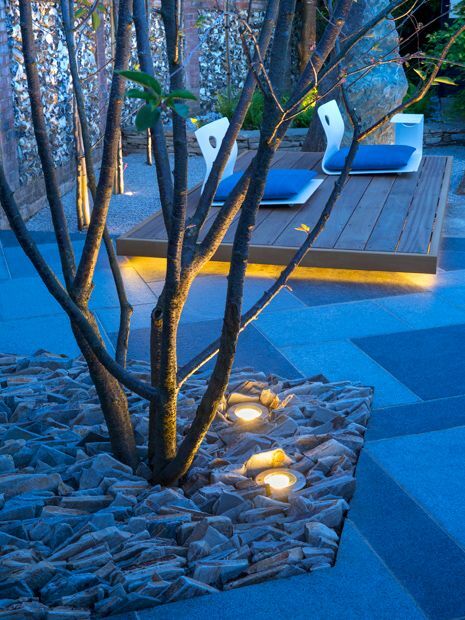 For our clients, this unique adventure signified a celebration of family visits to the Far East as an anecdotal landscaping vignette; for us, the project formed an energising, specialist garden design endeavour. 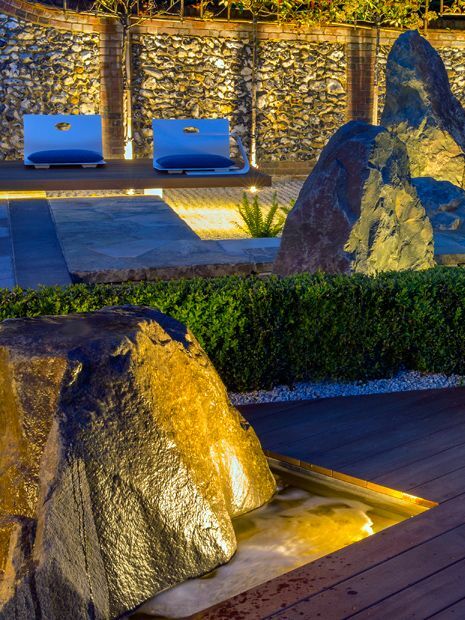 We spent three months on site through winter, managing 100 tonnes of excavations and craning rocks, where the end result is a serene, allegorical composition – a contemporary rock garden design. The garden setting formerly functioned as access for a carport, while its lacklustre herringbone pavers merely gathered moss and weeds. To provide shelter, humanise scale and enhance intimacy, we designed a tactile, stone-clad wall. Utilising alternate light grey and crystal black granite segments, our stonemason's effortless virtuosity produced a gamut of randomly protruding dynamic patterns. 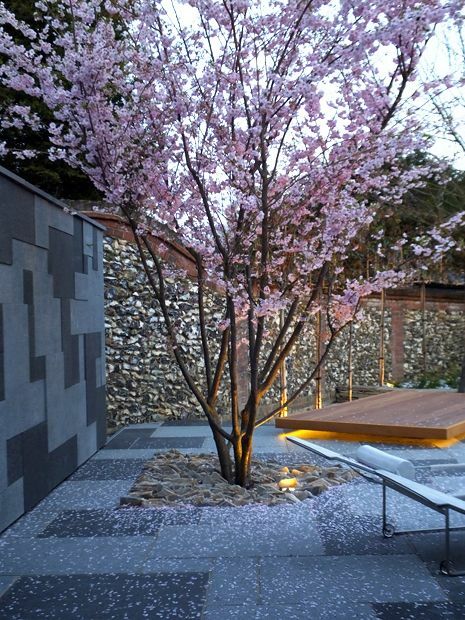 The 2.5-metre-high partition defines a solid backdrop, highlighting a sculptural Cherry tree silhouette, while integrated into Japanese courtyard flint walls. Two hardwood decks were cantilevered across steel frames, floating in minimalist clarity. 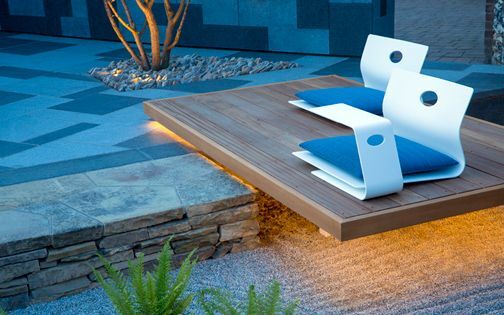 Lit below by LED strips, these expansive daybeds provide ample room for snuggling, revitalised at twilight when lighting redefines the garden. 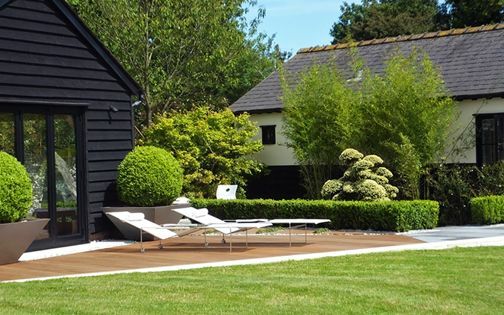 Crafted in solid Balau, the fascias and 6” deck boards are situated perpendicularly to the back wall, leading the eye towards an Essex horizon. This linear wood anthology was extended into the sunset lounge and guests' annexe to delineate a cohesive contemporary blueprint, within modern courtyard garden ideas. We included a concise palette of Japanese Ferns, augmented by native garden species; dotted sparingly into granite gravel, under tall Bamboo and trees, these foliar clusters form dainty filigree textures. Self-reliant, graceful and resilient, our fronded allies are indeed fast-growing, gleaming in the mellow light. 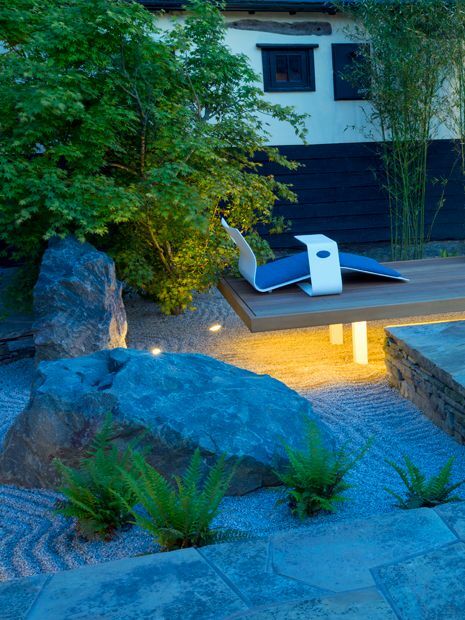 Tassel, Soft shield, Wood ferns and Hart's tongue soften the granite rocks and boulders with their foliage – infusing serene aura alongside a Japanese maple tree. We craned in over 15 tonnes of green granite rocks – this remarkable material was sourced in nearby Kent, forming a narrative for the hard landscaping framework. Six unique boulders were positioned across a diagonal axis, decreasing in height to resemble a family's hierarchy. The ultimate rock, set within the deck, was transformed into a gentle bubble fountain. The water feature demarcates the culmination of this metaphoric mountain ridge, producing subtle reflections as a transversal focal point, while firmly keeping it in the family! We often integrate aquatic elements into urban gardens, where they impart an organic layer of resonance and reflection, while expressing a connection to nature. Here, a sculptural green granite boulder was transformed into a miniature mountainous cascade, and since every crevice, cleft and undulation of this rugged stone has been shaped by millions of years in metamorphic evolvement, its overflowing water is diverted ad hoc via unexpected paths across an irregular rock face. 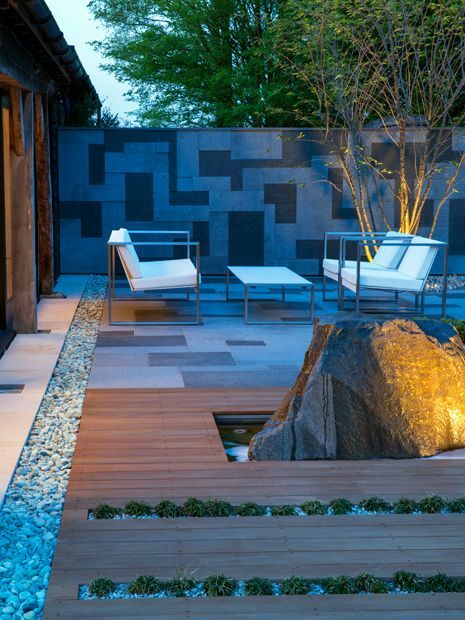 Enveloped by low clipped Box hedges, while emerging from hardwood decking, the waterfall design augments the contemporary Japanese courtyard garden with soothing reflections, amid a matrix of green. The ‘Accolade’ Cherry tree is a hybrid cultivar of two Japanese native species – Sargent and Rosebud cherries, producing an early spring interlayer of pink confetti snow – supplying copious wildlife friendly nectar relished by local bees. We planted a semi-mature, multi stem specimen, positioned in an asymmetrical bed carved into the granite paving. Mulched with a ridge of misaligned quartz paddlestones, this graceful tree narratively defines spring, while generating all-year-round essence, where its long growing season crescendoes into a glorious autumnal spectrum of striking crimson foliage. 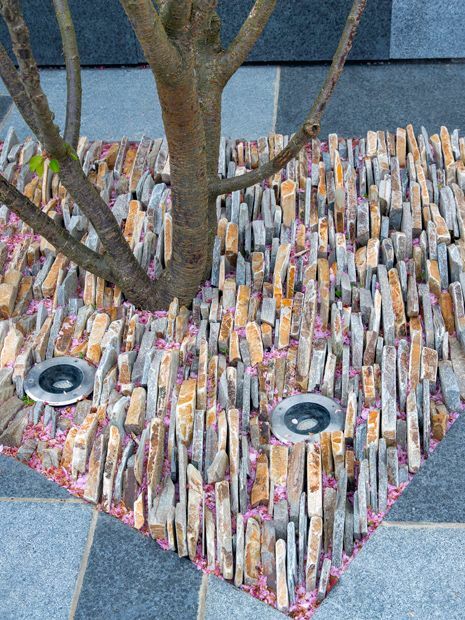 We selected a dozen natural stones to articulate a refined palette of surfaces and design details, where one of my favourites is a quartz paddlestone arranged around Cherry tree trunks by the granite wall. The serrated edges protrude upwards, densely packed, and form an intermission in the paved seating area. Facing west in a perfect grid, fallen petals are continually collected within this sculptural saucer of decay and renewal – dispersed by a heavenly flowering Cherry tree. 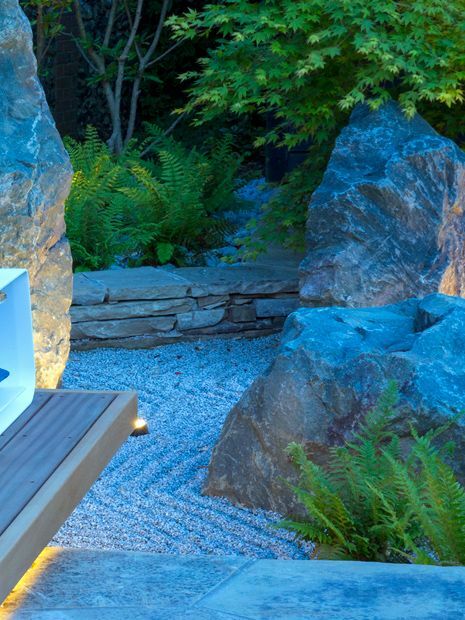 This spiritual essentiality underlyingly heightens the garden design's transcendence through detail intricacies, intermeshing an innovative methodology with progressive stonework skills to forge a modern reinterpretation of traditional Japanese landscaping techniques. We included half-dozen granite chipping sizes, from large cobbles under trees to medium-sized for the hedging, defining a Japanese temple's spirit. 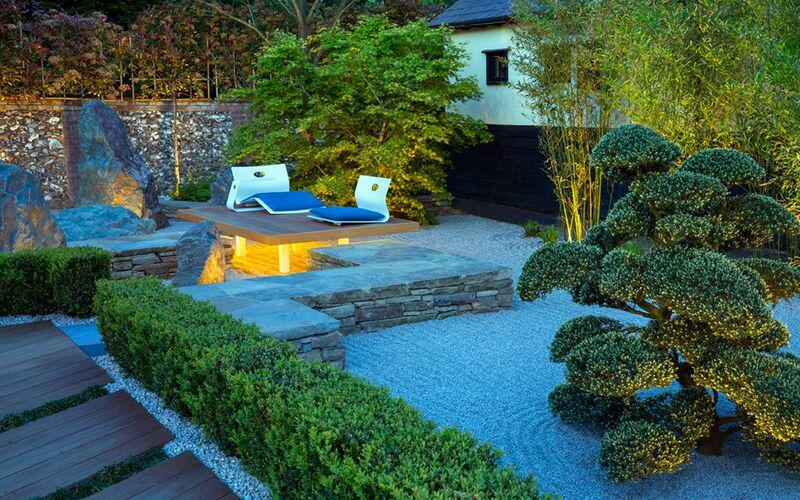 The 6mm granite which covers the sunken courtyard garden is raked religiously by the client into sinuous forms, spread below a Japanese Holly cloud tree and Bamboo, while reflecting vital daylight. 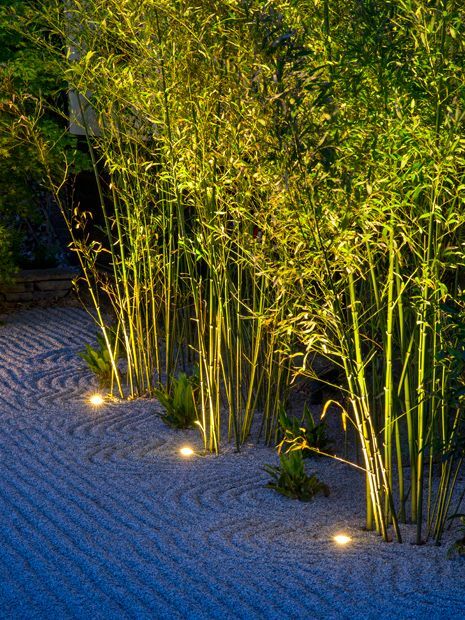 The tactile surface transforms this once clay-filled obsolete space into a harmonious, modern Japanese landscape garden within renewed level changes. 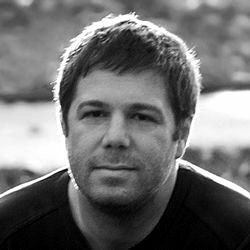 Since we'd provided a minimalist yet vitalising platform for the connoisseur of all things Japanese, our tireless client treats the stones as his own progeny – a truly dedicated family man! 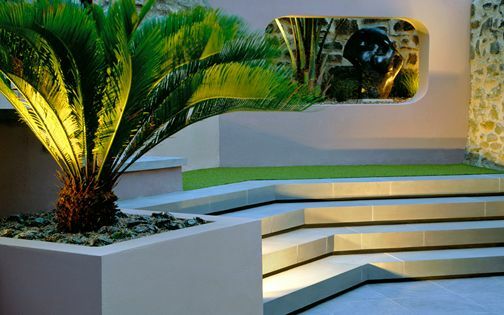 Every landscape design & build project we create features outdoor lighting – a practice synonymous with expressions of architecture, urban living and a contemporary alfresco lifestyle. Yet, here in the heart of the Essex countryside, surrounded by fields and a sunset above a flat horizon, the garden lighting glows gently into a Debden evening zephyr. 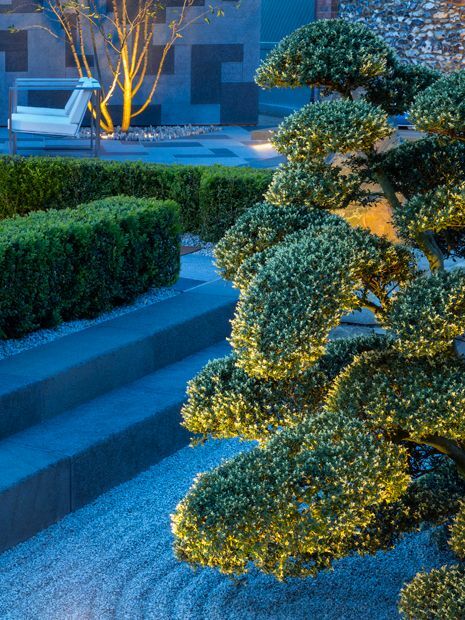 The myriad of trees and shrubs is highlighted with stainless steel fittings, where uplighting captures every trunk, stem and leaflet which narrates this modern Japanese courtyard garden. 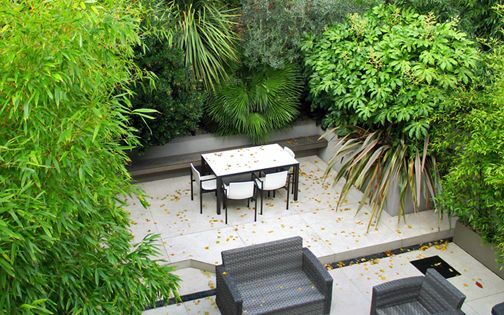 The floating decked beds generate a warm ambience, while sleek apparatus contrasts the continuum of granite rocks, emerald Ferns and glossy Camellias. Amid an eminently expressive natural material palette, cross lighting takes a leap into the unknown, as every nook and cranny creates an enchanting interplay of shadows and light. 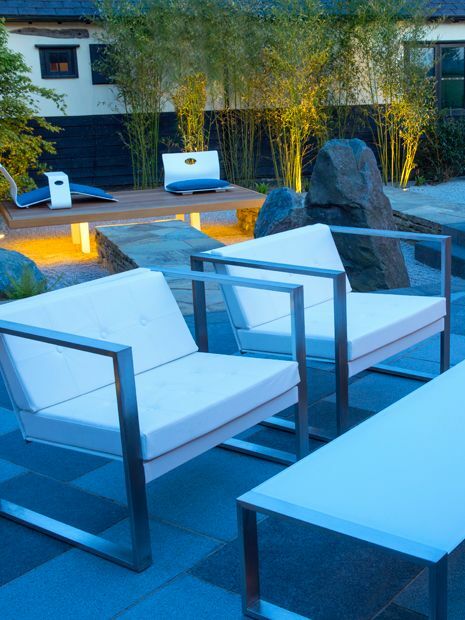 The clients added an elegant collection of modern garden furniture to expand our initial design concepts. The eclectic mix of Dutch and Austrian white seats, sofas, loungers and tables completes a renewed setting, where Viteo's Low collection and FueraDentro's Banca Lounge convey contemporary garden ambience. 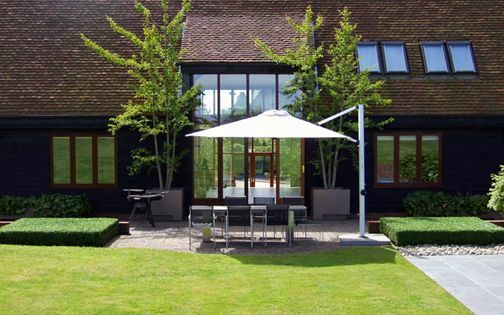 Outdoor seating is enjoyed by the clients and their guests – each spot defining a favourite perch, where a nonchalant courtyard disposition simply runs in the family! We utilise experience and intuition when developing design concepts for new clients; we contemplate, follow sites' integral topography and genius loci, or indulge in our own designers' whim to devise the most apt landscape blueprint. 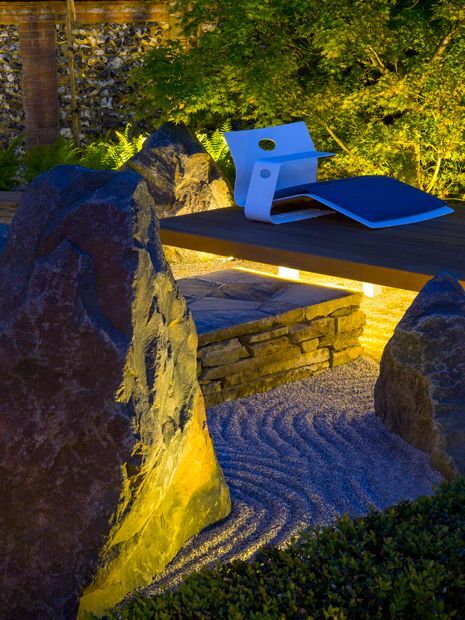 Yet, here in Saffron Walden, this was no such occasion, as we knew the site, the clients and the surrounding village thoroughly – the project's distinction was in the context of designing and building a contemporary Japanese garden right in the middle of the English countryside! 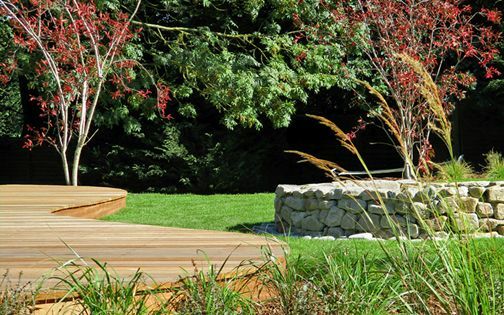 To create a spiritual landscape for a trusting client, and emerge it from the ground up, is to produce an evocative outdoor setting – a very personal garden design landscaping legacy.